A 26-year-old taxi driver was arrested for cramming at least 48 pupils into a minibus taxi. The pupils were "literally sitting on top of each other" in the 16-seat capacity Toyota Quantum, which was spotted by law enforcement on Monday at the intersection of Standford Road and Ditchling Street in Port Elizabeth. 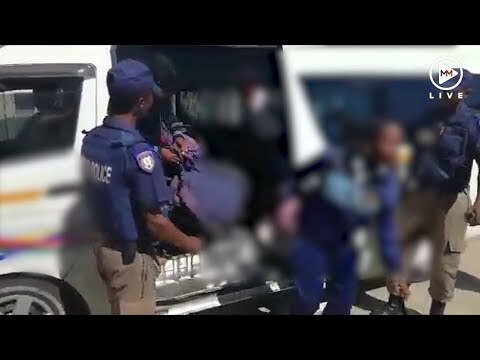 Video footage of the children being removed from the vehicle has surfaced on social media. Nelson Mandela Bay Metro Police Department officers said they were patrolling when they noticed the over-loaded white Toyota Quantum, which was driving in the opposite direction, said department chief Yolande Faro. "The metro police officer approached the driver, introduced himself and stated the reason for the stop. On inspection of the vehicle his suspicion was confirmed - that the vehicle was indeed overloaded with school kids sitting literally on top of each other,” she said. Faro said the taxi was stopped at around 2.30pm and escorted to Sidwell traffic department, where it was weighed for overloading, and where passengers were counted. A headcount revealed a total of 48 people - including the driver - crammed into the taxi. At the traffic department it was established that the vehicle licence disc only authorised a carrying capacity of 16 persons including the driver. The operator card was still valid and no outstanding warrants on the driver were found, according to Faro. "The driver loaded 32 additional persons in the vehicle, which is in transgression of the National Road Traffic Act," she said. Following the incident, drivers have been urged to refrain from overloading passengers, a crime which could result in accidents and subsequent arrests. Spokesperson for the metro Mthobanzi Mniki confirmed the incident - and said they would be be creating a precedent from this incident. "We will watch the case closely, because we do not want a situation where we say we should have done something when it is too late. We want to create a safe city," he told TimesLIVE. "The [metro police] department has also urged parents to assess the safety of pupils' transportation. Do not allow your kids to get into a vehicle visibly overloaded. Also make sure the driver has the required licence to transport passengers and the vehicle is in a roadworthy condition. Kids must also be told not to get into an overloaded vehicle,” said Faro.